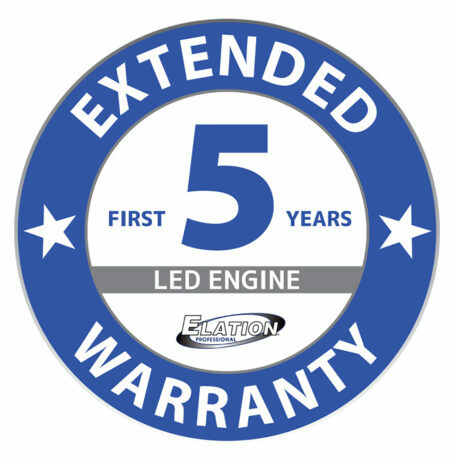 LOS ANGELES – Elation Professional is pleased to announce a new warranty policy that extends its standard limited product warranty to 5 years on LED light engine sources for some of its latest and most popular LED luminaires. In addition, warranty coverage on fixture components has been extended to 3 years for products used in registered indoor fixed installation projects. The 5-year/3-year limited warranty applies to Elation’s Artiste, Fuze, KL Fresnel, Seven and Profile LED product series for indoor installation projects installed and maintained by an authorized reseller. Products used on temporary indoor rental projects also benefit from the extended 5-year warranty on LED engine sources with warranty coverage on fixture components remaining at 2 years. All exterior-rated lighting products continue to be covered by Elation’s standard 2-year limited product warranty for the LED source and fixture components. The new extended warranty coverage went into effect as of April 1, 2019. Please contact your Elation representative directly for more details.